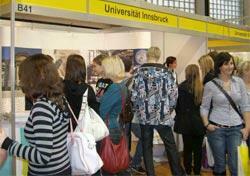 The University of Innsbruck goes to great lengths to offer prospective students a wide-ranging advising service. 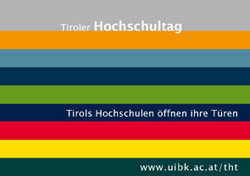 Every two years the "Tiroler Hochschultag" (THT) offers you the chance to get information about the numerous opportunities to study in Tyrol and to sample campus life. The Studies Advising for prospective students includes the organisation and coordination of attending educational fairs. Under the title "Studying in Innsbruck and Information on Grants and Scholarships" six educational and advisory facilities provide a joint service for Tyrolean schools. To answer clearly individual questions on your chosen study programmes and on organisational matters, it is worth having a personal chat with representatives of the University of Innsbruck. study-related matters and much more.